Cooking with Corey: Alien Resurrection: Attack of the Killer Mutant Green Peppers! 1 Alien Resurrection: Attack of the Killer Mutant Green Peppers! 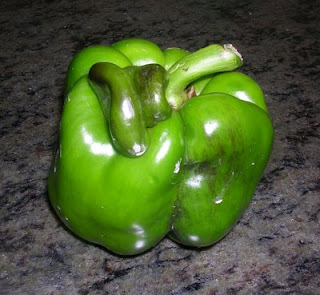 While chopping vegetables for tomorrow night's gazpacho, I ran across a hilariously grotesque green pepper. It was giving birth to another mini pepper, like something out of the movie Alien. This pepper looked like something something out of a freak show. Or a curiosity shop. I could probably sell tickets! Who knows, it might outsell the bearded lady. Hey, it's much cuter than a shrunken head! I like peppers that look like this!